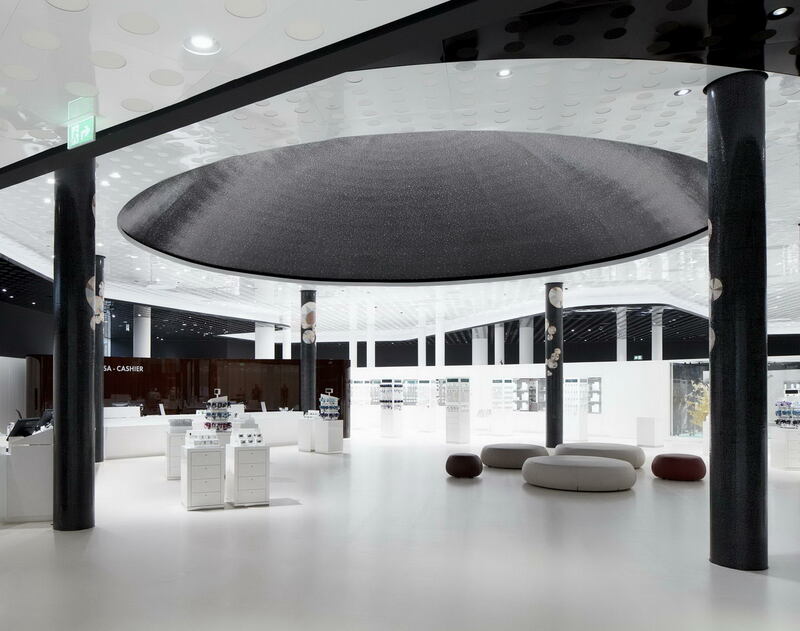 The redesign of Swarovski Crystal Worlds in Wattens commemorating its 20th anniversary is until present the biggest extension of the Swarovski World of Experience. 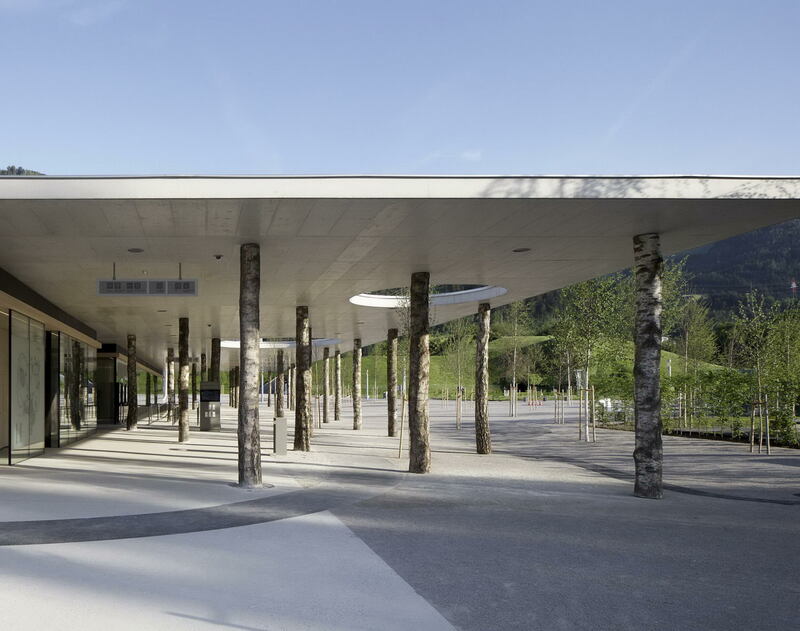 The reopening of one of Austria´s most visited tourist attractions in May 2015 also celebrates the 120th anniversary of the company´s founding. 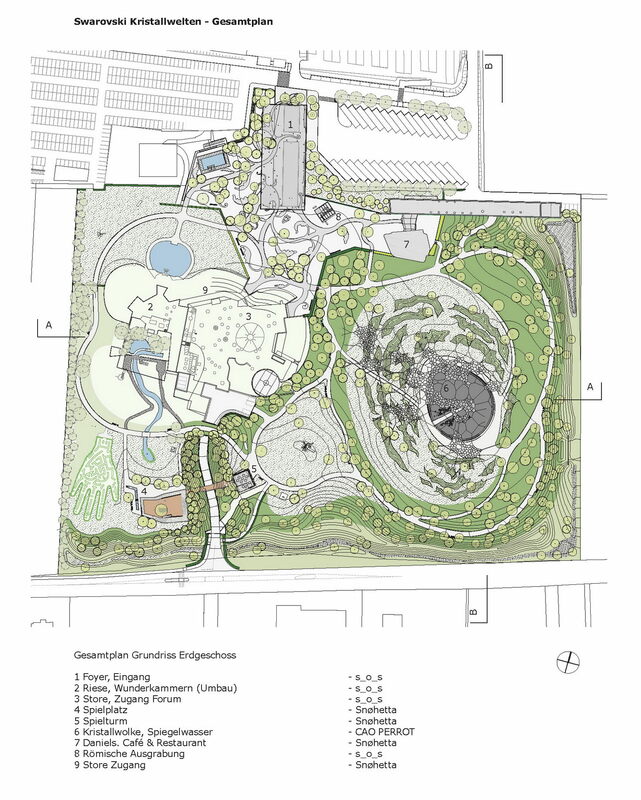 The generous extension of the park (Garden) includes the construction of new buildings as the Arrivals Building (Foyer), a restaurant (Daniels. Café & Restaurant) and the Playtower, and also the redesign of the Chambers of Wonder and the complete redesign of the Swarovski Kristallwelten Store. 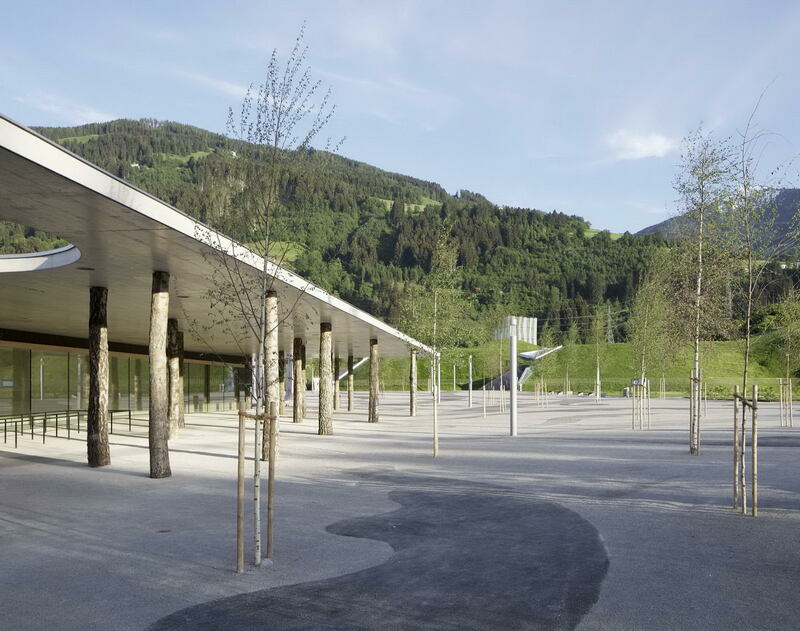 The project was planned and realized by an international team of artists and planners, in which s_o_s architekten, a project-related partnership of Schlögl-Süß Architekten and obermoser arch-omo zt gmbh I architektur, has been commissioned as general-planner. The overall art-concept was supervised by Carla Rumler / Creative Director Swarovski, the park including crystal cloud and mirror pond was designed by the landscape artists Andy Cao and Xavier Perrot / cao perrot studio – Los Angeles & Rennes, restaurant, playtower and store access were designed by the Norwegian architectural office Snøhetta / Kjetil T. Thorsen, Patrick Lüth. The new Foyer / Arrivals Building and the complete redesign of the Store with the new Forum access are the design of s_o_s architekten (obermoser arch-omo zt gmbh I architektur: Foyer; Schlögl Süß Architekten: new Store design and Entryway Forum). 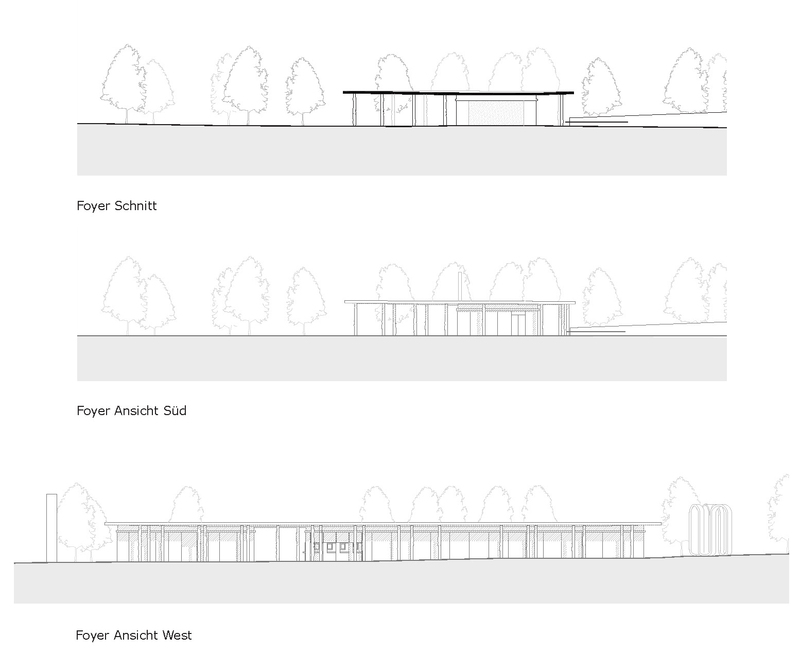 The design for the Arrivals Building/Foyer supports the inspirational idea of the landscape artists cao perrot studio, who planned a White Forest as threshold to the enlarged Swarovski Crystal Worlds. 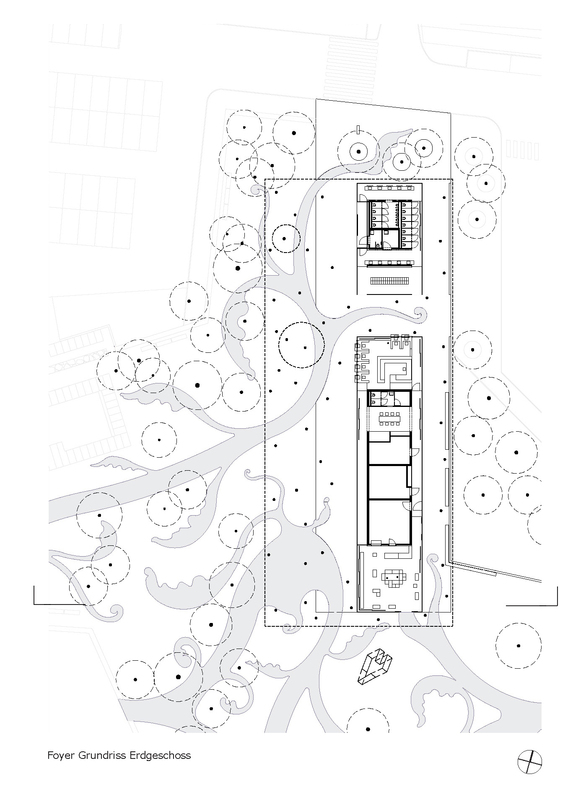 The vision for this project formalized into a 30×60 meters wide cantilevered concrete roof, archetypically embedded within a white forest and being supported by birch tree trunks. The cantilevered roof welcomes arriving groups, shelters waiting guests and introduces visitors to the Garden of Swarovski Crystal Worlds by framing horizontally selected viewports of it. 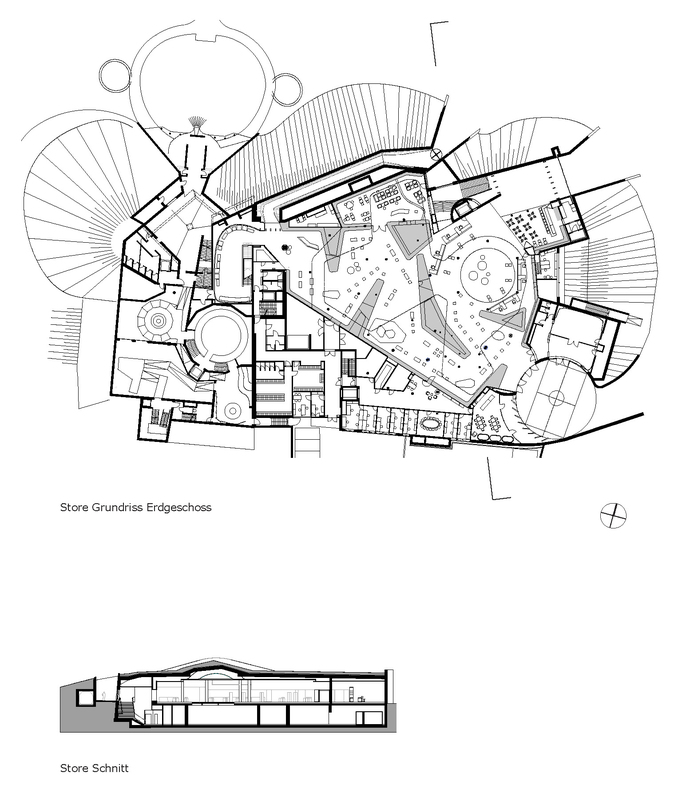 Circular openings pierce the roof, allowing patches of light and trees to grow through it. Walls and ceilings have been cladded in birch-wood to emphasize the natural component. 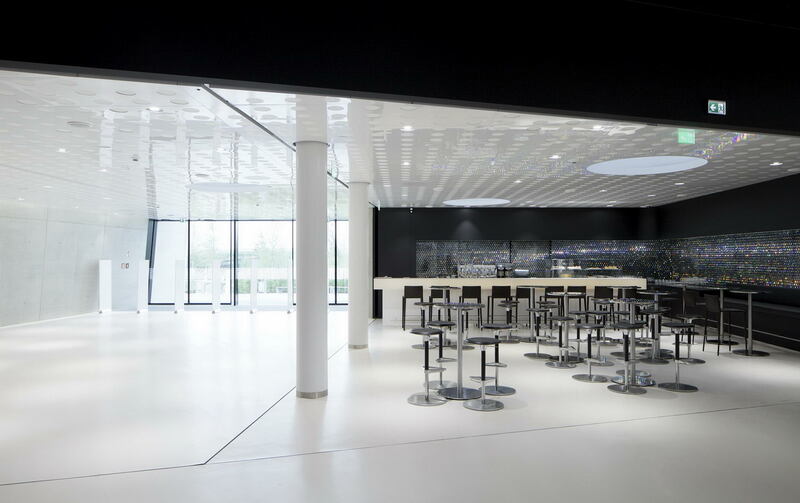 Two transparent cubes, centrally located under the rooftop, host all functional facilities: cash-desks, a Souvenir Shop, restrooms and staff areas. The minimalistic formal expression and a limited range of materials as wood, concrete and glass, have been conscious choices in order to avoid a competition to the attractions of Swarovski Crystal Worlds. Moreover, the clear structure of a reduced formal language refers to the “Spirit of Swarovski”. 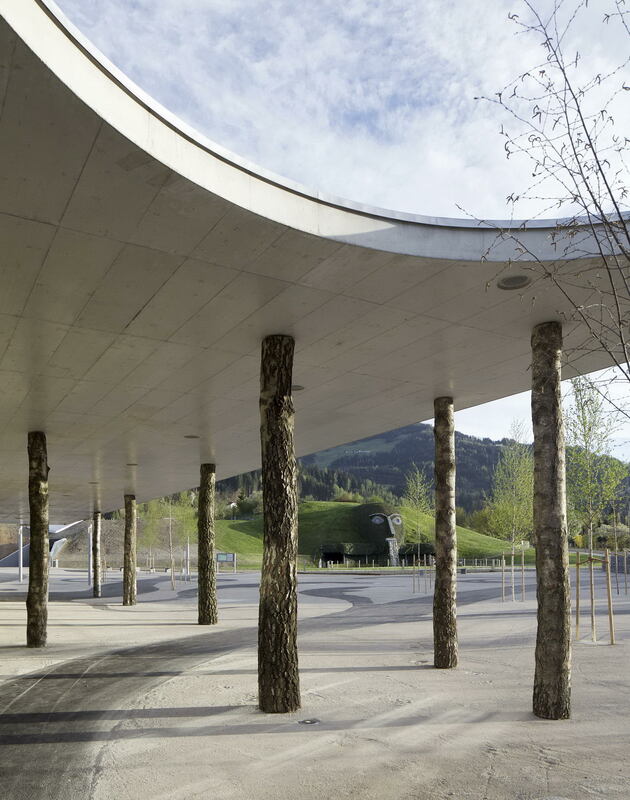 The open space under the Arrival Building´s roof merges with the wide area of the Grand Plaza, its main formal element, the Floral Pattern (paths laid out on base of a floral figure) starts here and guides visitors towards the Giant and the Garden. Situated at the southern end of the Arrivals Building, the Souvenir Shop invites visitors to grasp a last souvenir of their visit before leaving. 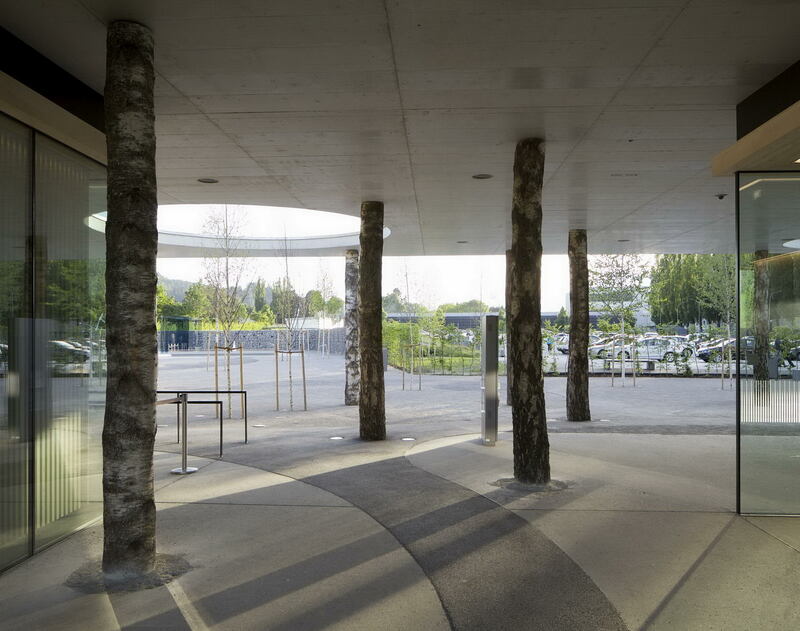 While on the western side a compact wooden curtain of birch slabs creates a visual filter in order to hide the shop from the visitors starting their visit, on the south and east side the building opens up to the Garden through a prominent glass front, offering glimpses of the interiors and acting as a huge show case reaching the visitors at the end of their tour. Interiors are arranged as an open space in order to enable the visitor a free stroll among the products. The playful and open character is echoed by the furniture, an ensemble of stackable, easy to combine and to relocate modular display cases, realized in a range of pastel colours. The North-South layout of the Arrivals Building allows to separate arriving and leaving visitors, the wide area on the Westside for arriving guests with views of the Giant and the smaller area on the eastside for people who are leaving. 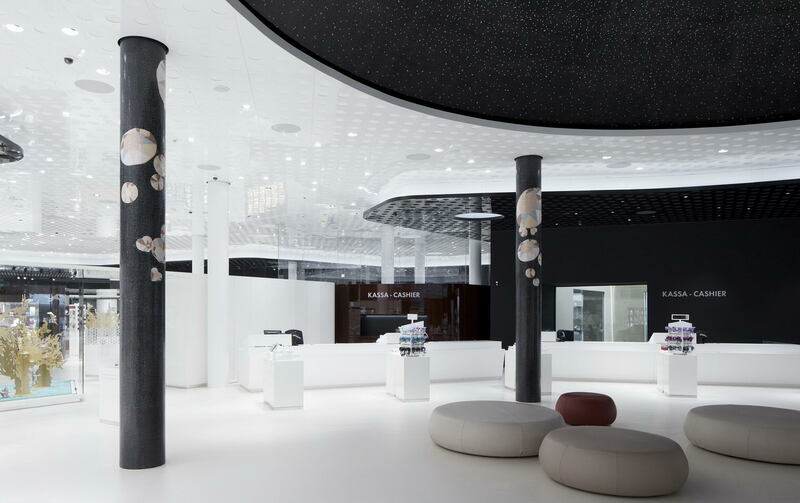 When the client decided to renovate the sales area of Swarovski Kristallwelten Store, a new design concept has been enabled and accomplished. Inside the existing “Black Box Hall“, now emptied, did originate a fascinating, abstract landscape structured along a winding river. By using different overlapping surfaces of floors, walls and ceilings, the indoor space scenery changes steadily. White shimmering display cases and noble wooden furniture elements emphasize the river banks, accompanying the visitor on his way through the Store. The ceiling, cladded in white and black metal, reflects further the lights and vitrines, adding glamour to the scene. Emphasized by a highly specified lighting-concept different spatial ambiences originate as a result. Due to the client’s request, large display cases have been exclusively conceived for the project in order to host temporary exhibitions. The merchandise furniture has been conceived as an eye-catcher, integrated into the partitioning walls to produce a window-effect framing the space and showing the essence of the varying theme-related products. The elaborate design of the VIP-Lounge area invites the costumer to relax while offered little refreshments. The new created Atrium brings a lot of daylight to the space and houses an elaborate art piece in its centre. A further attraction is the expensively decorated cupola at the end of the Store, close to cash desks and exit area. The Crystal Bar is part of this exit area, offering visitors refreshments before starting the journey into the park. Part of the project also was the relocation and new design of the access to the event-hall called Forum in the basement, allowing a spacious new foyer with wardrobe and additional rooms.